Anyone who is a friend of mine knows I'm not a fan of wind storms, especially the over hyped Atlantic bombs mentioned so often by the media which have dominated news feeds this entire 2018-2019 Winter period. I'm a storm photographer so I'm always after something photogenic and for me wind storms rarely produce much of interest for me, unless there are truly severe winds which could cause damage or massive waves, if these are on the list then I'm interested, particularly the latter. There are only three wind modes I'm interested in experiencing, and those are severe thunderstorm downdraughts, tornadic winds and blizzards, all of which can be truly severe and spectacular on camera, in fact, only two days earlier I encountered impressive outflow winds from a severe thunderstorm on Benone beach which was a thrilling experience. Then storm Gareth appeared, yet another named storm this season however this one did get my attention. This deep low pressure system would swing an active ana-type cold front across UK and Ireland with a narrow squall line for added measure, in it's wake deep unstable air would advect across NW UK through the daytime, however the better CAPE was expected to arrive at the N. Ireland coast before sunset and last through until late evening. GFS indicated 200 CAPE with LIs -1 however higher resolution models showed 500 CAPE, this would be in conjunction with very steep lapse rates, 30 knots of deep layer shear with tornado and supercell parameters all highlighted on convective maps combined with the passage of several troughs which would aid with lift. To me this was like a red flag to a bull, the potential existed for squally convective showers and thunderstorms which would be sheared and perhaps with low topped supercell traits. 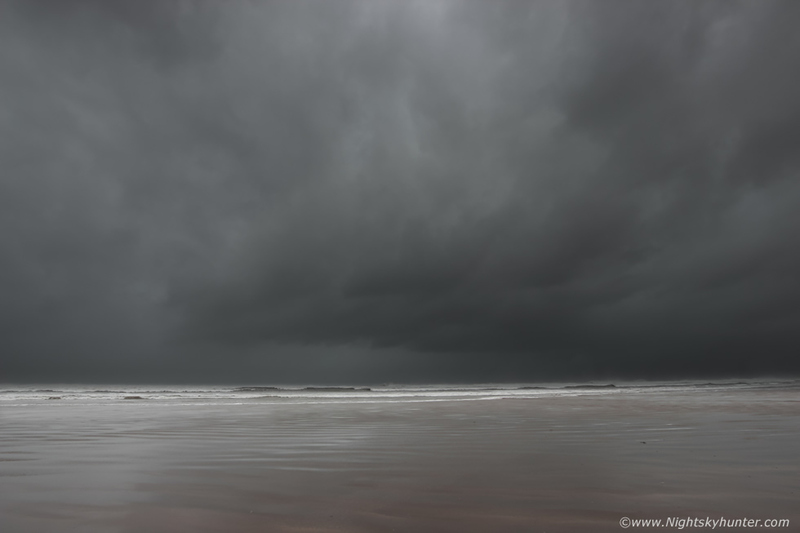 In addition the Met Office had warnings out for 70-80mph winds at the coast and high seas so there was plenty going on, I decided it would be foolhardy not to chase this set-up. I prepped the van, filled the flask, dressed in several thermal layers then hit the road at midday from Maghera and made my way to the north coast. 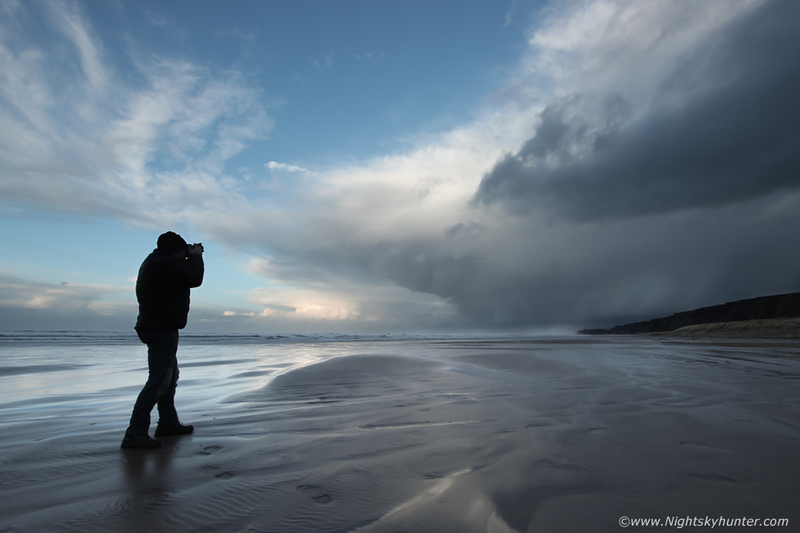 I had arranged to meet photographer Nigel McFarland at Benone beach and together we would document what this storm had to offer. I arrived and settled in, the sea was rough with moderate size swells which seemed to become more agitated with time, the strong wind was shearing the tops off the waves into horizontal tuffs of sea moisture and when the sun hit they formed pretty spray bows. We did notice that despite approaching low tide the sea was remarkably higher than it should have been for this time of year. We took a coffee break in the Sea Shed cafe which makes a great caramel latte by the way, owner and experienced surfer Dan entertained us with exciting chat about surfing and how the swells and tides work for his hobby and business. When we returned to the beach once again it was clear it was game on, by 15.00 the sea was raging and the wind was shaking the vans. For the rest of the afternoon we were astonished at the outbreak of thunderstorm activity across the sea in proximity to our viewing point. Radar and sferics showed several clusters of cells with very active lightning activity, there were many c-gs plotted as we watched with amazement. However our view of those storms was mostly hidden by blowing rain curtains or low level cloud so we couldn't discern any storm structure. 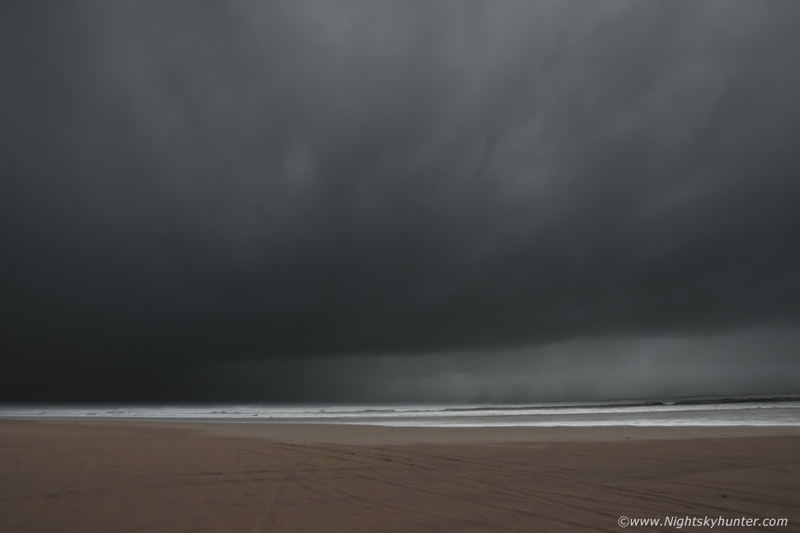 At one stage I was filming the waves rolling through the telephoto lens when I saw the sky light up with lightning behind Donegal, then a few minutes later it happened again, we could hear big angry rumbles of thunder reaching us even through the loud background sound of the sea. Radar showed these storms moving left to right in front of us and strongly sheared and still producing sferics all the way across the north coast. 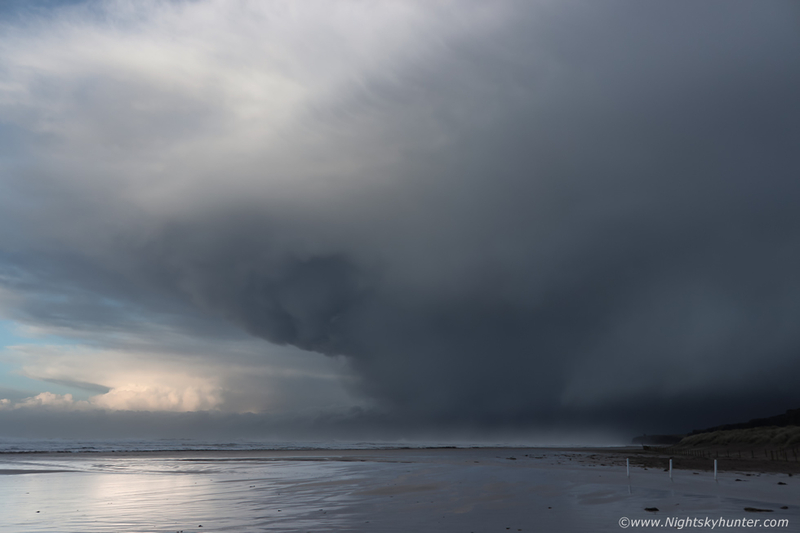 This is a wide angle image of a portion of that storm, that's the long updraught base with precip curtain which was blowing across the waves at high speed, sparks were happening somewhere inside that dark storm. Ten minutes later another image of the same storm has it moved rapidly to the east heading for Rathlin and west Scotland. You can make out the dark base and precip core, it was a pity about all the cloud blocking the view, had there been clear air around this cell I'm sure we would be seeing a nice sight with a big cb anvil and strong back-building towers, the obstructed view reminded me of the warm core set-ups we get during the Summer when the most severe storms are often hidden by cloud or haze, that being said it was exciting even to have a visual on that area and knowing it was producing copious c-gs. We spent the rest of the day watching the skies however all the storms were hidden by cloud and rain, in fact, the rain was relentless, there seemed to be shower after shower with no breaks between and no clear sky to get a visual on storms which were still ongoing to the NW. We were saying it was good to have experienced a thunderstorm but what we were lacking was our structure shot of the day, if we could get that then I would be more than content with today's action. 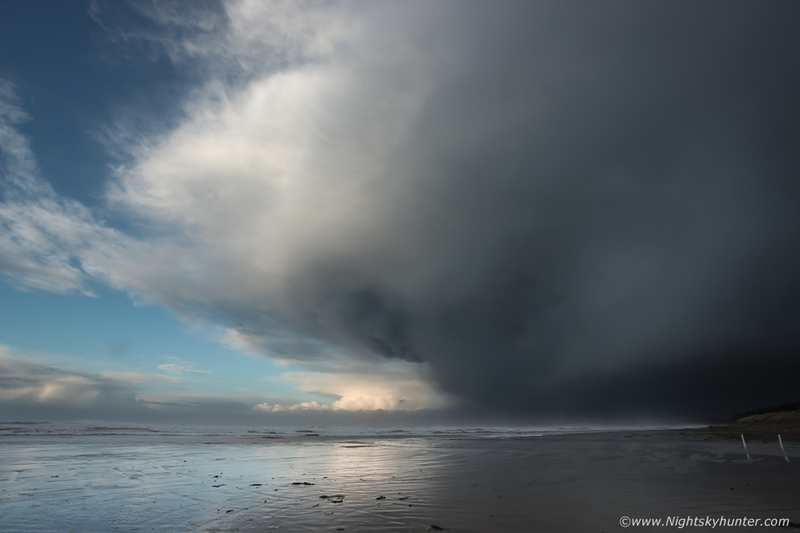 One hour before sunset we were getting bombarded by yet another cell which was crossing our zenith, great curtains of rain were being driven across the beach in a powerful squall, however Nigel and I sensed something was about to happen, we could see a break and anticipated a photo opportunity about to reveal itself. If this cell passed on we should get a brief clearance and might get to see the back end of it, there was another cell behind with a great wall of precip charging in behind it so our window would be brief. The cell passed and a clearance yawned open and suddenly we had light and there, out the driver's side window, was the cell itself, I leaned out the window and shot this with the 10mm wide angle, check out the big anvil as it moved from left to right. We got out from the vans for a better view and it was then that we got treated to an impressive sight, the rear of the cell looked dramatic and immediately presented us with the photo opportunity we wanted. Considering this is wide angle it was exciting to see how large the cell was, check out the anvil, the cluster of mammatus and curved flank which gave the impression it was turning, the rear certainly looked sculptured by the wind, this scene made our day. 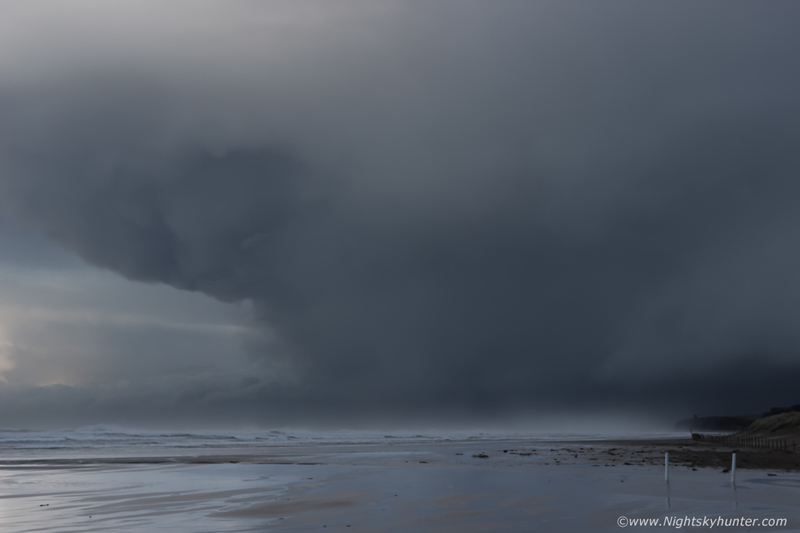 Storm with lifeguard hut in the sand dunes, this was taken straight after the above image yet look how much the cell had moved between the two shutter clicks, it was blasting east and away from us at a rapid pace thanks to the strong steering flow, we had to work fast to get images. I switched to the 18-55mm for a closer view, making sure to cover the lens exchange to avoid sand and salt being blown into the sensor. I rather like the moody scene and colour, you can also see in all of these images a white band of wind-driven sea spray blowing across the surf into the back of the cell, it almost looks like the 'ghost train' from Skip Talbot's videos, however its a combination of sea spray, wind driven rain, and out flow winds from behind us all catching the light of the sun. Check out the distant cell to the left far away heading for Rathlin, solid updraughts which looked to be tilted and anvil, given the synoptic conditions I wouldn't rule out that storm having supercell traits. 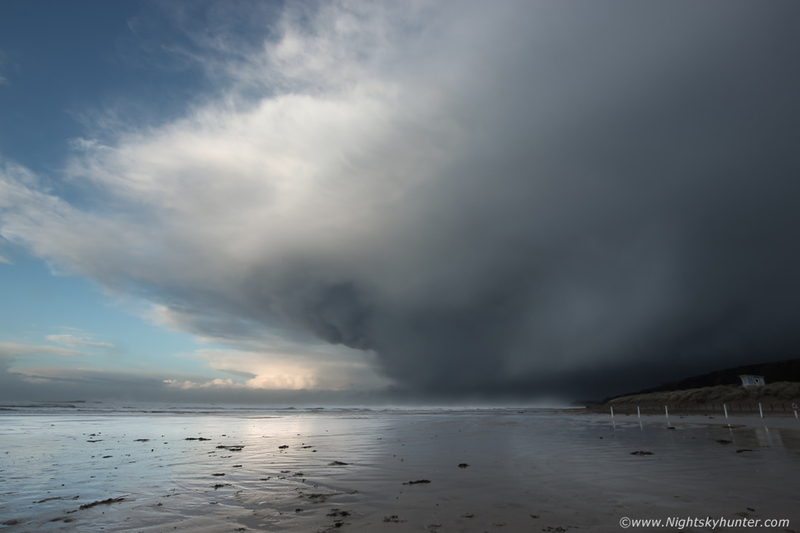 One more this time at 35mm, then the cell was gone and blown out of range, you can see Mussenden Temple on the cliff just behind the precip core. Nigel and I were well chuffed, that was a nice sight to end the day, I was now content, anything else would be a bonus. Wide angle capture of the departing storm cell and Nigel in action just moments before the next cell arrived behind us with more heavy rain, we ran back to the vans for cover. 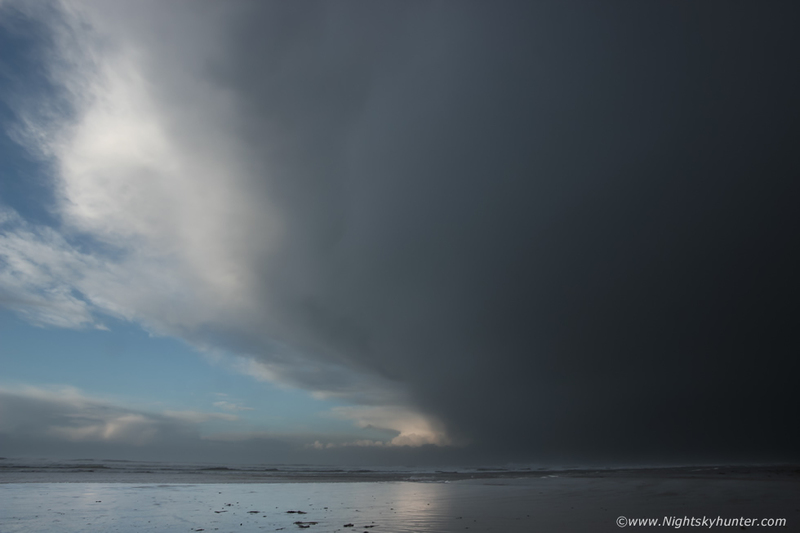 We got impacted by more squally winds and torrential rainfall, then we saw flashes of lightning close by behind us and heard thunder, that cell was sparking over the Binevenagh and Foyle area. As it passed over us during the last light of day we spotted this dramatic scene, I watched it as the wipers whipped back and fourth across the windscreen, I decided it was worth a shot, so I got outside in the rain and grabbed two stills, it was low light and approaching blue hour. You would be forgiven for thinking this was a bowl-shaped lowering under an updraught base, but in fact it was sinking air as the storm began to relax and decay, we could see the clouds falling but the dead give away was the mammatus on the left indicating the cell was past its mature stage, just shows how looks can be deceiving and how important it is to know your storm structure. Regardless of what it was doing it didn't matter as it still looked dramatic, exciting to watch, and a nice catch on camera. Darkness fell, we noticed the sea sneaking up on us while on the beach due to the rising tide and deepening storm so we backed up away from the beach and onto the concrete slip way where it was safe, on a normal day you would have a good 300m or more of beach to cross to reach the sea, if low tide it could be more, so we knew we were safe here. I was parked in darkness watching for lightning, I decided to go out and open the side door of the van to get a drink of water from the canteen. Suddenly I saw a wall of water approach and the sea was instantly flowing past our vans over the concrete slip way, I jumped into the side door to avoid getting soaked and banged my head on the roof splitting it, a superficial cut but it hurt like mad and bled, the cut is still visible on my head as I write this three days later. My left leg got soaked then the water retreated just as fast, that was a one hundred percent storm surge! Realizing the storm surge could happen again at any moment we got prepared, we reversed further back along the road to a safe distance, past the Sea Shed cafe and parked there. Full beam headlights switched on to help the cameras, I had my window mounted Go Pro at the ready, my Next Base dash cam and I was hand holding my DSLR for video with the 50mm F/1.8 lens wide open for maximum light, the ISO was at the top of the scale but it was the only choice to get footage. 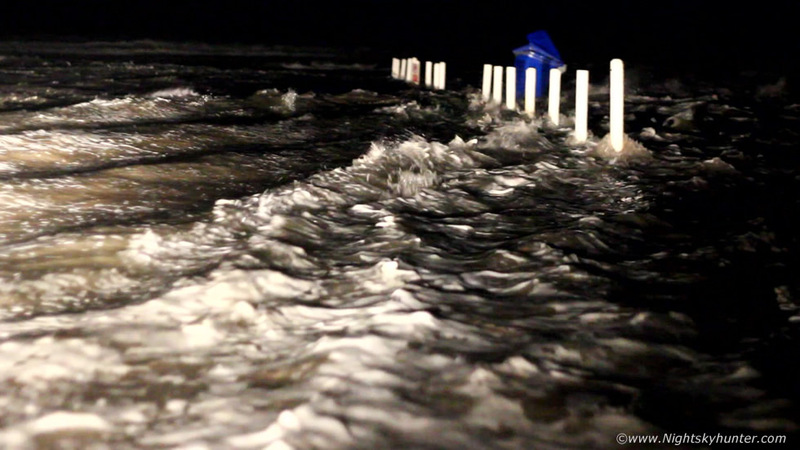 We waited and waited, then perhaps half an hour later we saw another storm surge coming, this time we were ready for it, I began filming with all three cameras, to my left Nigel was filming from inside his van. 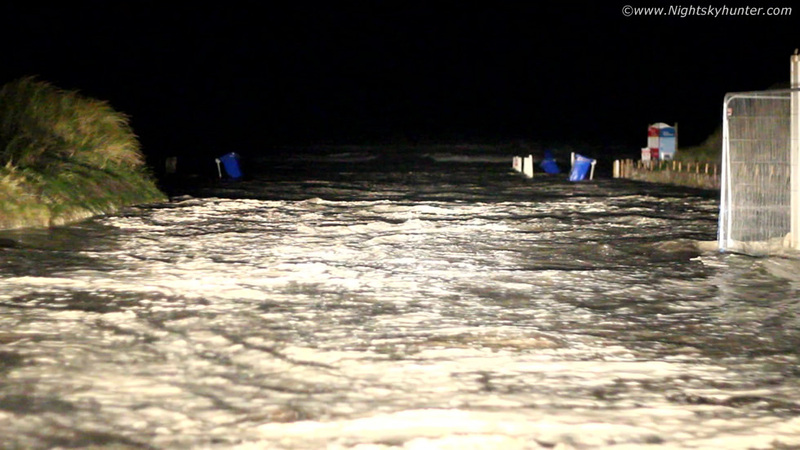 These are stills taken from the footage, from the darkness came the storm surge, it looked for all the world like a tsunami, bins were lifted, it was quite astonishing as normally you do not see the ocean this far inland, we let it approach. It came even further along the concrete road than the previous surge and swallowed both of our vans, it was powerful enough to move the metal barriers to the right which were anchored down securely. Outside the window we were surrounded by sea water, it really was an amazing sight. Quite incredible, then it withdrew like a tsunami would and we were back to wet concrete again and no sign of the ocean to be seen. We were safe though on a concrete road and could easily reverse if needed, we wanted to get footage and we did so safely, the only thing at risk was our vans getting wet. 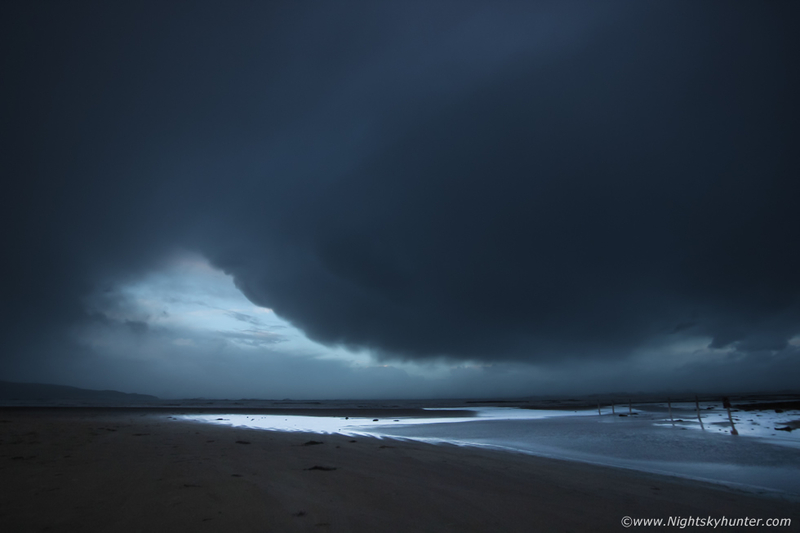 Then just as the water resided the sky lit up with a big flash of lightning just to add icing to the storm cake. 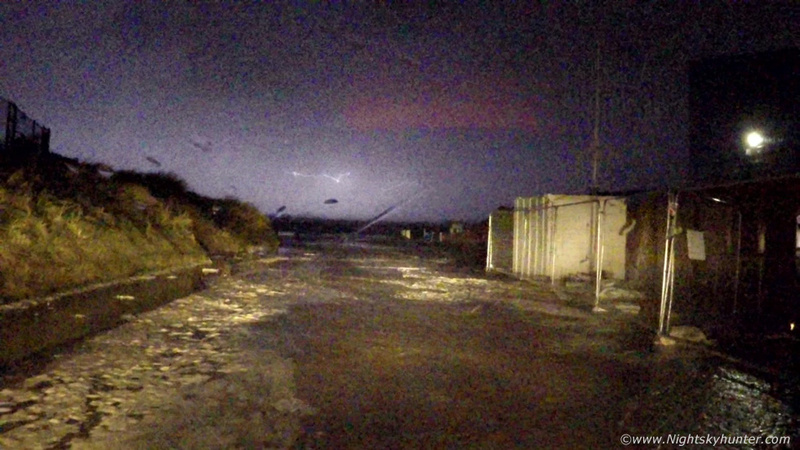 I got it with the dash camera and Go Pro, it was from a storm over Donegal crossing the north coast, for a moment it caused a white out on the camera frame, this video grab was after the white out showing the in-cloud bolt vanishing into the storm again. 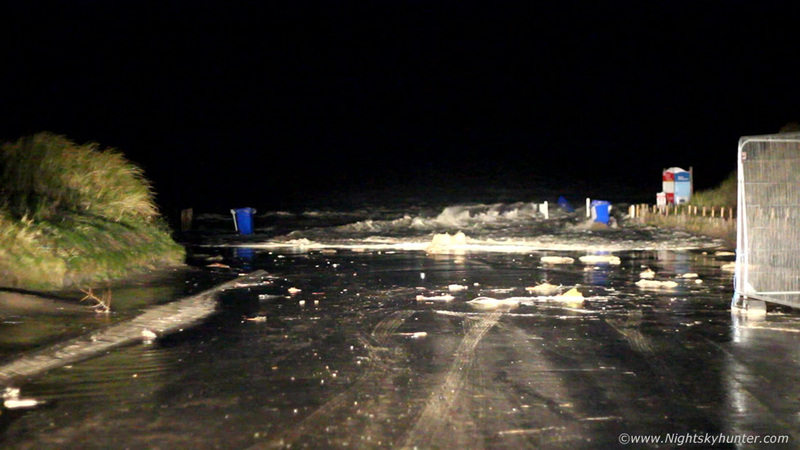 We got hit by yet another storm surge and during one comical moment one of the blue bins floated between our two vans at close range without hitting, I just heard Nigel say ''hello bin'' as it bopped past us, I burst out laughing, a surreal yet amusing moment in the madness. More lightning flashes lit up the sky so we changed location to high ground at Castlerock where we watched more lightning light up the sky in blue flashes then at 23.00 UT we decided to call it a day. What an action packed day of thunderstorms, cells, night lightning and storm surges. Full video footage of various scenes from the day including the nice cell, dusk base and several of the storm surges as seen from different cameras. I hope you enjoyed the read and the footage. 2019 has certainly been producing the goods, personally speaking I've had three thunderstorm days with night lightning and associated severe weather, I look forward with great interest to see what nature will produce during Spring and Summer.